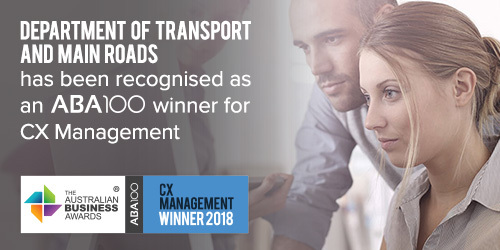 Department of Transport and Main Roads has been recognised as an ABA100 Winner for CX Management in The Australian Business Awards 2018. The Australian Business Award for CX Management recognises organisations that have achieved outstanding results through initiatives that demonstrate excellence in customer experience management. The Department of Transport and Main Roads (TMR) is responsible for shaping Queensland’s transport system, building the network, managing use of the system, and providing passenger services for all Queenslanders. TMR is responsible for a large portion of Queensland’s transport industry and state and federal allocated transport budgets. This means it is extremely important to drive improved financial performance as well as focusing on revenue and growth opportunities. To do this, TMR’s main focus is to to put the customer at the centre of everything they do. In order to truly transform customer experiences, TMR has a strong business and service delivery model. TMR’s Customer Experience Transformation Program (CETP) was established in 2015 with the clear objective to work with the business, with its people and with its customers. This program works across the department to support and continue to build TMR’s capacity to listen to the voice of its customers. TMR does this by utilising human-centred design methodologies and practices. By doing this, TMR strives to provide a seamless customer experience across all touch points in Queensland’s transport network. The CETP collaborates with customers, stakeholders and TMR employees to co-design positive, customer-centric solutions. To facilitate this, TMR has built a customer research, design and insights function to support the department’s capacity to capture the voice of the customer, voice of the business and voice of TMR people. The CETP has been designed to support and facilitate change while empowering employees and TMR customers. The CETP is building and supporting an organisation that drives customer-centred design thinking. The program wants customers to feel that they are valued, listened to and that their feedback is reflected in the department’s actions and outcomes. The end vision of the CETP is that TMR is recognised as a leader in customer experience and that it is an example of excellence in customer centred co-design.